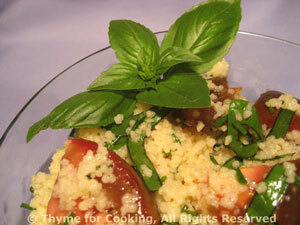 Couscous with Tomatoes and Basil, Thyme for Cooking easy, gourmet sides. Simple couscous finished with garden-ripe tomatoes, fresh basil and a light vinaigrette- easy and delicious! Slice tomato then cut slices into quarters. Whisk mustard, oil and vinegar together in a small bowl. When couscous is ready, add tomato, basil, vinaigrette, fluff gently with a fork to combine and serve.